One of my friends from college makes a great baked oatmeal. It feeds tons of people and is super yummy topped with milk or ice cream. Never had baked oatmeal before? Boy, you have not lived until you have tried it. Imagine something the consistency of an oatmeal cookie topped with baked cinnamon and sugar - nom! Here's the recipe from my friend (who got it from a friend of his). Be sure to size this down and note my awesome substitute for milk! Cream together sugar, oil, and eggs. Add oatmeal, baking powder, salt, milk and cinnamon. Put in 9 x 13 in pan that has been greased. Bake at 350 degrees for 30 minutes. ENJOY! I like to eat mine with ice cream... and apparently, bake it with ice cream too. Delish! Happy breakfast. I was hoping this day would come at some point in my life- the day I’d actually win an award for something I whipped up! Indeed, that day has come. 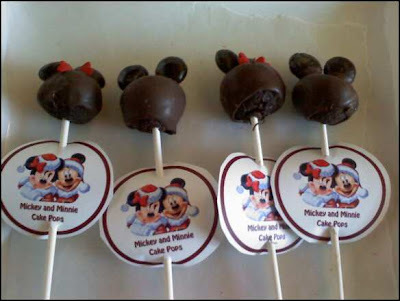 Last week, I made my own spin on Bakerella’s cake pops – Mickey and Minnie Cake Pops – for our Charity Bake Sale. They turned out great and much to my delight, I was awarded a Golden Spoon (an amazing wooden spoon wonderfully spray-painted in gold) for “Best Candy.” Yeah, I still got it. Anyway, here’s a brief rundown and the recipe if you’d like to make your own this holiday season! Cake Balls are basically just cake mixed with frosting, rolled into balls, then dipped in chocolate. They are a staple of an amazing baker/blogger known as Bakerella. If you'd like more background on them, check out my earlier post- Cake Balls of Deliciousness. 1. Prepare cake as directed and allow to cool for at least an hour. 2. Crumble cake into fine particles with your hands into a large bowl. 3. Add an entire can of cream cheese frosting. Mix evenly. 4. Roll the mixture into small, 1 inch balls and place on wax paper. Refrigerate (overnight) if you can. 5. When you're ready to decorate, melt your melting chocolate in a deep bowl according to the directions on the package. 6. 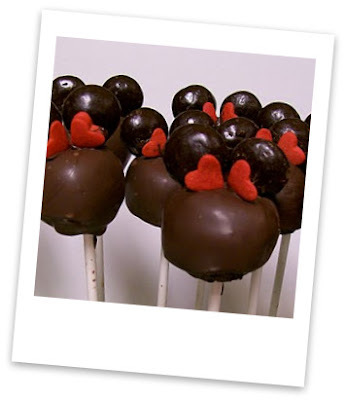 Dip the tip of each lollipop stick into the melted chocolate then straight down into the cake balls on your wax paper. You are making cake on a stick here, essentially. 7. Once you've completed that step and the melted chocolate on the stick has been able to set, use the lollipop stick to dip the cake ball into the chocolate. Tap the stick towards the top (towards the cake ball) to drip off excess chocolate. 8. Working VERY quickly, attach two Junior mints as the ears (be sure to press down a little bit into the chocolate/cake ball) then two red heart sprinkles sideways to form a Minnie bow (if you are making Minnie). The chocolate dries in a matter of seconds! If it sets before you can get the bows on (which happened to me several times), dip one side of the red heart sprinkles back in the chocolate and use it as glue to attach. Repeat the same for any ears that might fall off. 9. Allow to dry by stuffing the lollipop stick down into a large foam block. It should hold the pop in place when it dries. Repeat! Just one box of cake mix will literally make nearly 50 pops if you need em so get crackin. 10. To make the display, remove all the pops from the foam block and lay them on wax paper (as long as they have set, they will be fine for the time being). 11. Wrap the box in your chosen gift wrap (I used holiday theme). Then set the pops back down into the styrofoam - and voila, cake pop display! Alternative: You can also cut out circular labels and poke a hole in the top and bottom for the pop to go through. Great for giving individual pops as gifts! That's it for me today. Hope you have fun making your own cake pops! Good luck on getting your own golden utensils. I heart mine. This year, Disney held a "decorate an ornament" silent auction. I barely got my baked goods ready in time for the bake sale on the same day so I wasn't going to participate. But then, inspiration struck/my desire to contribute overcame me. But what could I make with such limited supplies (sharpies, white out, file folders, and glue) on limited time (mere hours)? The answer was staring me plain in the face- what was the color of the ornament? 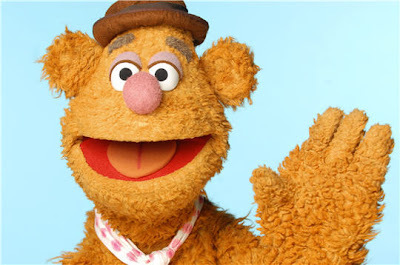 None other than Fozzie Bear! 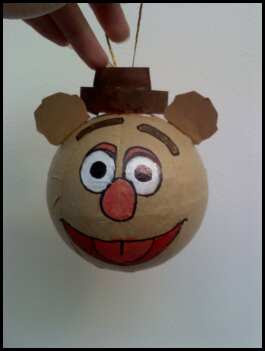 This lovely ornament was crafted from nothing other than a brown paper covered ornament, sharpies, white out, glue, and a dark brown file folder in less than two hours. Both the hat and the ears are simply cut outs from the file folder and glued to the top of the ornament. White out stood in for eye paint. Fozzie faired well at auction and sold for $20 (the starting bid was $5!) Just goes to show you that sometimes inspiration comes when you least expect it and yields very creative and fruitful results. Ello friends. As we approach the holidays this week, I'd like to let you all know what to expect from Living with Annie and what awesome I have in store. Today through Wednesday of this week, visit me for some fabulous LwA posts including a new super-cute recipe, exciting award-winning news, and more. This Thursday and Friday, due to traveling to Iowa and you know - Christmas - I will be away on vacation. Be sure to check back in after Christmas. You don’t want to miss my posts that will finally show off all the creative little projects I did as gifts this year (complete with tutorials!). Post-Christmas, Living with Annie will be back, and better than ever, with new posts on Tuesday, Dec. 29. Wishing everyone good luck on their last bits of shopping and, if you’re like me, on those massive project/presents you started and need to finish by Thursday!